Media Matters is flooding social media with negative posts from Hannity’s long career as a TV and radio host, as well as periodically blasting out a list of Hannity’s advertisers. Hannity’s primetime Fox News show at 10 p.m. — which consistently earns stellar ratings — has been a constant voice of support for President Trump amid a sharply critical media environment. Hannity’s unflappable support for Trump has made him a prime target for Media Matters and other activists on the left. Media Matters previously targeted Hannity’s advertisers in May after the Fox News host pushed a conspiracy theory surrounding murdered DNC staffer Seth Rich. 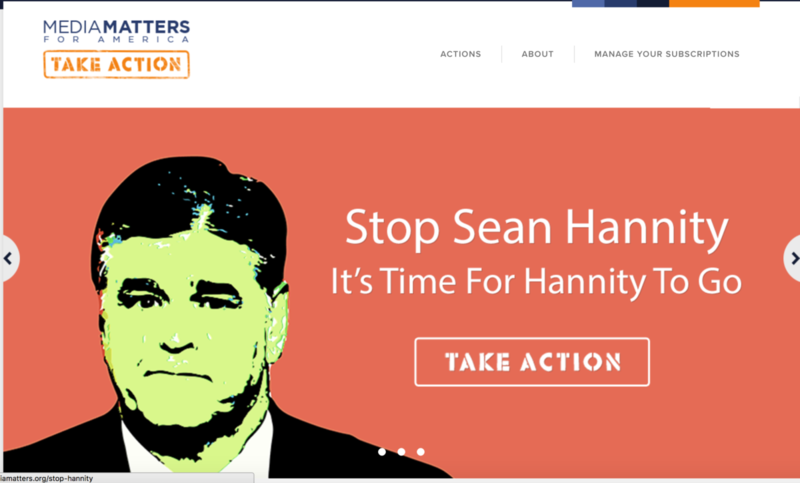 The Media Matters pressure campaign resulted in several of those advertisers — including the military insurance group USAA — to pull their ads from “Hannity.” That strategy came to a (temporary) halt, however, when conservative activists began targeting the advertisers for MSNBC’s Rachel Maddow and other liberal hosts. USAA caved and pulled its ads from Maddow’s show, before eventually reinstating its advertisements on both MSNBC and Fox News.